Classification F.C.I. N. 197: Group 2 - Pinscher and Schnauzer - Molossoid breeds and Cattle Dogs and other breeds; Section 2.1 Molossoid breeds, Mastiff type; without working trial. Experts of this particular breed more or less agree on its origin in Asian regions, mainly in Tibet highlands from where it later spread all over the world, in Europe mostly, following various directions. 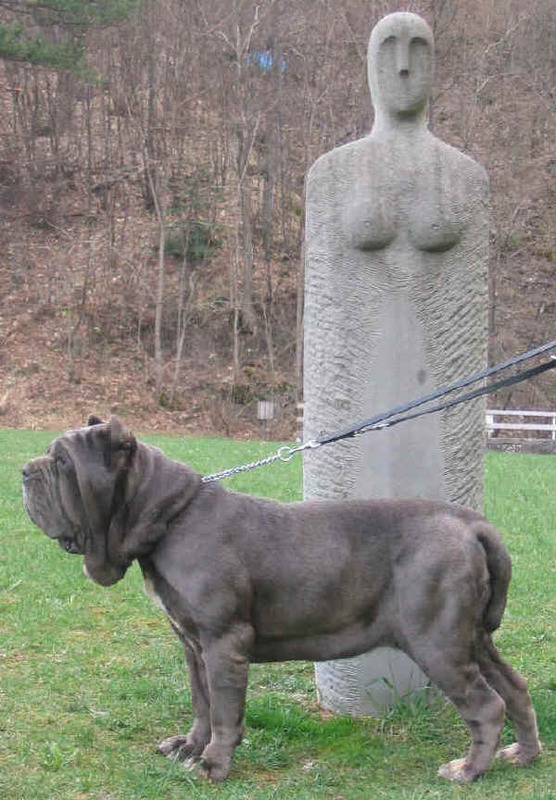 The history of the ancient molossian, to which it is connected the one of the Neapolitan Mastiff, follows the history and the most important phases of the human adventure. Since long time man and dog have lived in symbiosis sharing emotions, discoveries, conquests, victories; together in wars, battles and hunting. Centuries ago on Himalaya highlands lived a large sized molossian, applied as a watchdog to the monasteries, with a long twisted tail on the back: it was the legendary Tibetan Mastiff reared by the Buddhist Monks. Those who had been lucky to see it, had described it as a really enormous dog looking more like a lion than a dog. Marco Polo himself, on seeing these dogs a few centuries afterwards, was really baffled. Some experts think that the famous legend of the Jeti, the snow man, may have been born from this animal. This was a dog, disappeared in the past, that left his genetic imprint, as it was considered the real ancestor of all big mountain dogs; furthermore, it is the direct ascendant of the Assyrian Babylonian molossian, which is represented in ancient drawings and documents, like the famous Nabeth Situla. This was the ancestor of the most powerful war dog in the world, the Macedonian molossians that were applied as sheer war machines in the big and devastating wars of those times in that area. These marvellous animals were lead to Rome where they were trained to combat in circuses, where numerous exhibitions and dreadful fightings were taken, usually against wild beasts or men. During the centuries in Rome dogs mixed with either Celtic dogs from the North, that had spread in Rome thanks to the victories of Caesar in the Gallic wars or with the great molossian of Epirus that trade exchanges with Phoenician ships in the Mediterranean had favoured. In the following centuries these molossians were mainly reared in the south of Italy, as it was in that area, in the region Campania actually, that the famous Gladiator schools, like the one in Capua, were held. Afterwards the various rules in the south of Italy played a considerable role for the breed: for instance, the kings of Spain introduced the dogs of the ‘conquistadores’ with big head and short legs. They were called ‘perro da presa’, that is ‘lurcher’, modified into the present Neapolitan slang ‘ cane e presa’. This breed was later given the name of ‘Mastiff’ from ‘massatinus’, the guardian of the ‘masseria’. At the beginning of the 20th century this breed was applied just to watch the Neapolitan farm hinterland; during the 1st World War it was drastically cut down and only few examples survived. Only in 1946, however, Mr Piero Scanziani, an important Italian expert in this field, and a writer by profession, discovered this ancient molossian in Naples. This is what Scanziani wrote after he first saw a Neapolitan Mastiff: “I recognized it immediately: it was one of the hundred that Paolo Emilio the Macedonian had brought to Rome in his triumph. It was the great dog of Epirus, the offspring of the Assyrians, the Tibetan nephew, It was the Molossus. From the height of his centuries he, the lad, was staring at me imperturbable, his eyes were not hostile, yet not kind – a gaze that does not give and does not ask: it just contemplates. He was gazing at my Arno on the lead. I stepped back remembering D’Annunzio – a molossian ready to bite without a howl. He became a patriarch.” Thus Scanziani was able to regenerate the breed of the Neapolitan Mastiff. The first steps towards the recognition for this breed was the first appearance at the exposition in Naples in 1946 where eight Mastiffs were presented, unsuccessfully, though, because of a lack of homogeneity. Then this breed spreads outside the region, mainly in Tuscany, precisely in the city of Prato, where Mario Querci, the breeder of Ponzano, was to become a real legend among the canine associations all over the world. In short this is the incredible story of the Italian Molossian, nowadays considered one of the most ancient breeds in the world. That’s why I think it should be protected at the best as it is a real living monument belonging to the Italian culture. A very large dog, with a very impressive statuesque built which shows fierceness, strength and power. It is the most suitable breed to watch the property. The Neapolitan Mastiff is a watchdog that is highly reliable for the care of any property: it sure that he will never go beyond the property he is guarding, so that anyone will never get inside his zone. This dog could be called ‘an armed guard’. At the same time he is an affectionate dog, very fond of the people he loves, of the family and the master that takes care of him. The Mastiff should not be trained to attack or to defend because its true temperament would be confused. Therefore all the tales about this breed are not true: if its natural instinct is respected, its character would not be unreasonably aggressive. Short and massive, with a skull wide at level of zygomatic arches; its length is about 3/10 of the height at the withers. Ample skin with wrinkles and folds of which the most typical and the best marked goes from the outer palpebral angle down to the lip angle. The upper longitudinal axes of the skull and the muzzle are parallel. The skull is wide, flat, particularly between the ears, and, seen from the front, slightly convex in its fore part. The bizygomatic width is more than half the length of the head. The zygomatic arches are very prominent, but with flat muscles. The protuberances of the frontal bones are well developed; the frontal furrow is marked; the occipital crest is hardly visible. Nose: set in the prologation of the muzzle, must not protrude beyond the ourter vertical line of the lips; must be voluminous with large, well opened nostrils. Its colour is according to the colour of the coat: black for the black subjects, dark grey-brown in dogs of other colours, and chestnut for brown coats. Muzzle: it is very wide and deep; its length corresponds to that of the fore-face and must be equal to the third of the length of the head. The lateral sides are parallel (between them), so that, seen from the front, the shape of the muzzle is practically square. Lips: fleshy, thick and full; upper lips, seen from the front, form an inverted "V" at their meeting point. The lower lateral profile of the muzzle is shaped by the upper lips; their lowest part is the corner of the lips, with visible mucous membranes, situated on the vertical from the external angle of the eye. Jaws: powerful with strong jaw bones and dental arches joining perfectly. Lower jaw must be well developed in its width. Teeth: white, well developed, regularly aligned and complete in number. Scissor bite, i.e. upper incisors closely overlapping the lower ones in close contact, set straight to the jaw, or pincer bite, i.e. upper incisors meet edge to edge with the lower incisors. Eyes: set on an equal frontal level, well apart one from the other; rather round, slightly deep set. Compared with the coat colour, the colour of the iris is darker. The eye may nevertheless be lighter in coats of diluted shades. Ears: small in relation to the size of the dog, of triangular shape, set above the zygomatic arch, they are flat and close to the cheeks. When they are cropped, they have the form of an almost equilateral angle. Profile: the upper profile is slightly convex. Length: rather short, measures about 2,8/10 of the height of the withers. Shape: conical trunk shaped, well muscled. At mid-length the perimeter is equal to about 8/10 of the height at the withers. Skin: lower edge of the neck is well endowed with loose skin which forms a double dewlap well separated, but not exaggerated; starts at level of the lower jaw and does not go beyond middle of the neck. The length of the body exceeds by 10% the height at the withers. Top line of the back is straight; withers are wide, long and not very prominent. Back: broad and of a length about 1/3 of the height at the withers. The lumbar region must be harmoniously united with the back, and muscles well developed in width. The ribcage ample, with long and well sprung ribs. The circumference of the thorax is about 1/4 more than the height at the withers. Rump: wide, strong and well muscled. Its obliqueness compared with the measured horizontal on that of the hip bone (coxal) is about 30ƒ. Its length is equal to 3/10 of the height at the withers. The hip bones are prominent to the extent of reaching the top lumbar line. Chest: broad and wide with well developed chest muscles. Its width is in direct relation with that of the ribcage and reaches the 40-45% of the height at the withers. The tip of the sternum is situated at the level of the scarpular-humeral joint. Tail: broad and thick at its root; strong, taperinq slightly towards the tip. In length it reaches the articulation of the hock, but usually is docked at about 2/3 of its length. At rest is carried hanging and curved in sabre fashion, in action lifted horizontally or slightly higher than the top line. Forequarters: on the whole, the forequarters, from the ground to the point of the elbow, seen in profile and from the front, are vertical with a strong bone structure in proportion with the size of the dog. Shoulders: their length measures about 3/10 of the height at the withers with an obliqueness of 50ƒ-60ƒ on the horizontal. The muscles are well developed, long and well defined. The angle of the scapulo-humeral articulation is 105ƒ-115ƒ. Arm: measures about 30% of the height at the withers, Obliqueness is of 55ƒ-60ƒ furnished with significant musculature. Elbows: covered with abundant loose skin, They are not too close to the body. Forearms: its length is almost the same as that of the arm. Placed in perfect vertical position, of a strong bone structure with lean and well developed muscles. Pastern joint: broad, lean and without nodosity, continues the vertical line of the forearm. Pastern: flat, continues the vertical line of the forearm. Its inclination on the horizontal towards the front is of about to 75ƒ. Its length is equal to about 1/6 of the length of the limb from the ground up to the elbow. Forefeet: of round shape, large, toes well arched and well-knit. The pads are lean, hard and well pigmented. The nails are strong, curved and a dark colour. On the whole they must be powerful and sturdy, in proportion with the size of the dog and capable of the required propulsion in movement. Upper thigh: in length measuring 1/3 of the height at the withers and its obliqueness on the horizontal is about 60ƒ. It is broad with thick, prominent but clearly distinct muscles. The thigh bone and the hip bone (femur and coxal) form an angle of 90ƒ. Lower thigh: length slightly inferior to that of the thigh and of an obliqueness of 50ƒ-55ƒ, with strong bone structure and well visible musculature. Stifle: the femoral-tibial (hip bone-shin bone) angle is about 110ƒ-115ƒ. Hock joint: very long in relation to the length of the leg, its length is about 2,5/10 of the height at the withers. The tibial-tarsal articulation forms an angle of 140ƒ-145ƒ. Hock: strong and lean, its shape almost cylindrical, perfectly straight and parallel, its length is about 1/4 of the height at the withers; eventual dewclaws should be removed. Hindfeet: smaller than the forefeet, round with well-knit toes. Pads dry, hard and pigmented. Nails strong, curved and of dark colour. Skin: thick, abundant and loose all over the body, particularly on the head where it forms numerous folds and wrinkles, and at the lower part of the neck where it forms a double dewlap. Type of coat: short, rough and hard, dense, of the same length all over, uniformly smooth, fine and measures 1,5 cm maximum. Must not show any trace of fringing. Colour of coat: preferred colours are: grey, leaden grey and black, but also brown, fawn and deep fawn(red deer), with, sometimes, little white patches on the chest and on the tip of the toes. All these coats may he brindled; hazel, dove-grey and Isabella shades are tolerated. Faults: any departure from the foregoing points constitutes a fault which must be penalized in proportion to its degree.